This event is organized by the AgriCOOPh Federation, in collaboration with PAKISAMA, and in cooperation with Cooperative Development Authority (CDA), Colectif Strategies Alimentaries (CSA), and Asian Farmers Association (AFA). 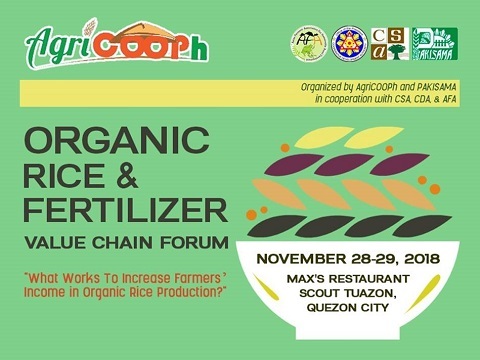 Commercialization of Organic Fertilizers ; and many more ! A minimal participation fee of P 1,500.00 per person will be collected for the payment of venue and meals (AM/PM snacks and lunch) for 2 days. A provisional program of activities is attached for your reference.We look forward to your participation and support. Help us spread the word by forwarding this invitation to your members and partners ! There are only 100 exclusive seats available for this forum and we will accept on a first come-first serve basis. Upon submitting the form, please expect a confirmation email from us. For queries, clarifications or concerns, you may reach the Secretariat thru agricooph@gmail.com or annadr.agricooph@gmail.com or call us at (02) 717-1330 and look for Ms. Anna Del Rosario.